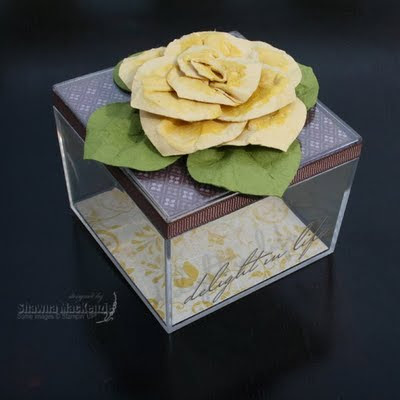 This project started out with me trying to figure out how to recreate a paper rose that I saw online. It was August and my Stampin' UP! preorder containing my Ornament punch was sitting on my table, when I had a lightbulb moment. Instead of trying to hand cut a dozen or more tiny paper petals, what would happen if I punched them out instead? This was my second flower attempt, which explains why it looks a little squished (I was having a tough time deciding how to glue it down flat). 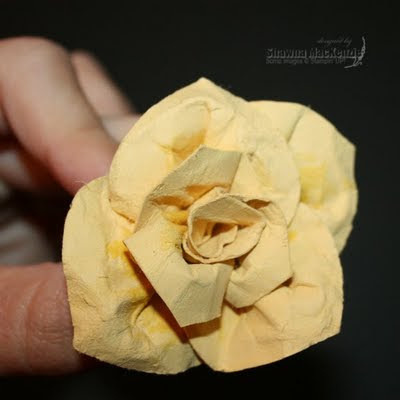 I've also made these flowers out of tissue paper and plain paper. 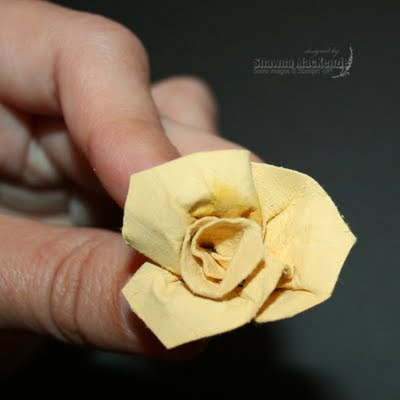 See this post for a Faux Suede rose that I added to a card. My first attempt at this didn't turn out quite as well as my second. It's definitely a practice makes perfect type of project. However, I loved the result. Here's how to make your own. Feel free to email me if something isn't quite clear! Begin by punching out 10-12 cardstock ornaments in the colour of your choice. The points of each ornament will become petals. Spray your cardstock ornaments with water and crumple them up to distress them. 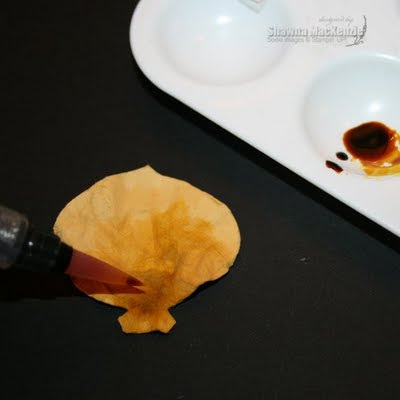 To add dimension to your finished rose, use an aquapainter to watercolor the base of the petals. Here I used Crushed Curry on So Saffron cardstock. 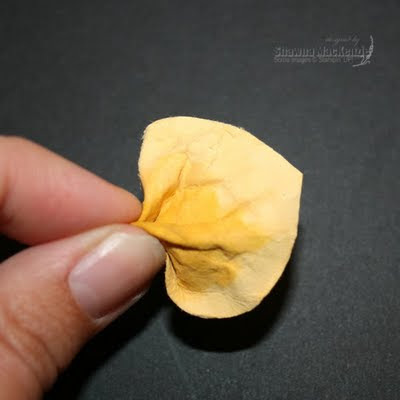 Roll your first petal into a bud shape. Start at one end and roll to the other end, curling the petal as you go. 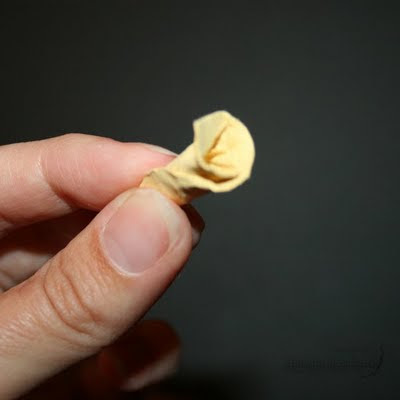 To create your next petal, pinch the base of the petal to create a fan shape. The higher you pinch the base, the smaller your petal will be. Use three smaller petals to add to the bud you've created. I found that SNAIL adhesive worked to hold the petal temporarily in place while adding more petals (make sure they're dry). Keep pinching the base of the flower bud as you add layers to it. Continue adding petals to your rose until it's the size you want it to be. I used a total of 12 petals on my finished rose. To finish my rose, I wrapped the base with sticky strip to hold the petals in place and trimmed as close to the petals as possible to eliminate the bulk. I punched four more ornaments to create the leaves for my final project. Thanks for looking. I'd love to see your creations! Wonderful idea. I'm going to try to do this. So many different ways you could use these flowers. thanks. Wow! This is gorgeous. When I bought this punch I was worried it would be too limited in its application - was I ever wrong! I am so glad I bought it. Thank you so much for sharing this fabulous idea!